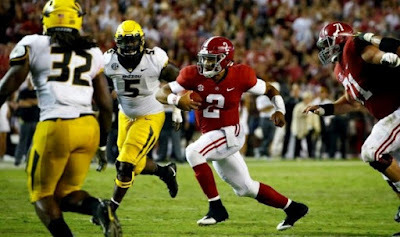 Tagovailoa wore a protective brace on his right knee against Missouri, throwing for 265 yards, three touchdowns and no interceptions before aggravating the injury while sliding on a run. Trainers tended to Tagovailoa on the field, and he was able to jog off under his own power. He immediately went into a sideline tent to receive medical attention. He missed Alabama's next offensive series and was replaced by Jalen Hurts. Tagovailoa spent nearly 10 minutes in the tent, with his parents coming down from the stands to visit him. "Tua is OK. He got the same injury as he had before," coach Nick Saban told ESPN after the game. "We just didn't put him back in the game." Tagovailoa, a Heisman Trophy front-runner, injured the knee a week earlier during a win over Arkansas. Saban labeled the injury a sprain on Thursday and noted that Tagovailoa hadn't missed any reps in practice. Hurts, who started 28 straight games with a record of 26-2 prior to becoming a backup this season, came on for the injured Tagovailoa. 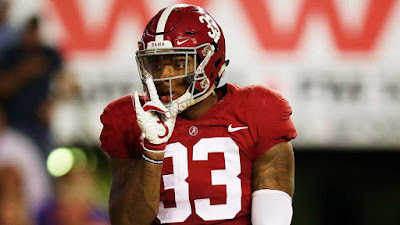 The junior and former SEC Offensive Player of the Year has appeared in every game this season, completing 30 of 42 passes for 453 yards, five touchdowns and one interception.